An officer wishing to arrange his men in a solid square found by his first arrangement that he had 39 men left over. 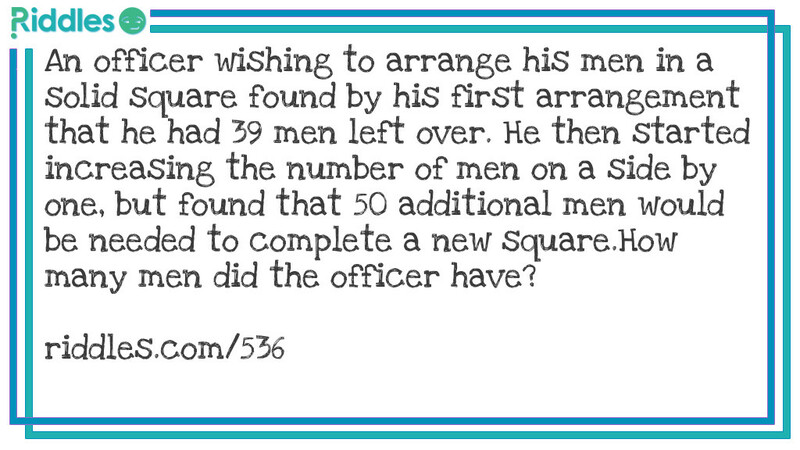 He then started increasing the number of men on a side by one, but found that 50 additional men would be needed to complete a new square. How many men did the officer have? The officer had 1975 men. When he formed a square measuring 44 by 44, he had 39 men over. When he tried to form a square 45 x 45, he was 50 men short. Solution to Solid Square Riddle Meme with riddle and answer page link.